This section of the parkway contains some of the most spectacular scenery along the entire motor road. Two wonderful recreation areas, Linville Falls and Crabtree Meadows, lie along this section of the Parkway. 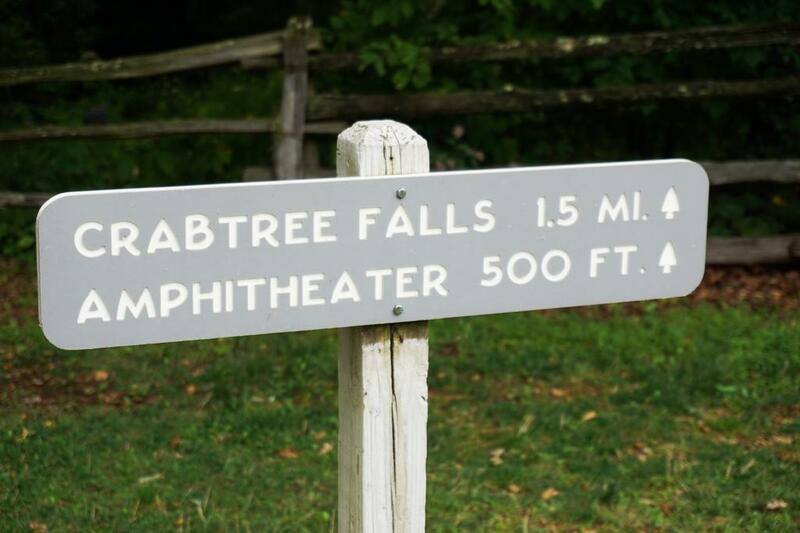 This sign marks the start of the Crabtree Falls trail at the former visitor center. 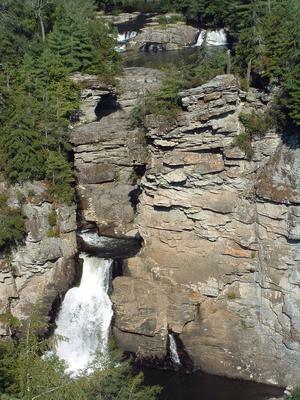 A closer shot of Linville Falls as seen from the Chimney View overlook. At this section's southern end (and junction with Section 4), you'll find the access road for Mount Mitchell State Park, containing the Appalachians' highest mountain - Mount Mitchell - at 6,684'. Spectacular views of the Black Mountains can be found along the climb from NC Route 80, which - in the winter - is generally the only way to access Mount Mitchell by vehicle. Trails along this section of the Parkway include some of the most well-known in the region, such as Linville Falls and Crabtree Falls. The Mountains to Sea Trail crosses the Parkway and follows it for a distance in this section as well, before branching off to the south. You can follow the Green Knob trail to the historic fire tower at its peak, for a spectacular view of the Black Mountain range, which dominates the view along much of the southern part of this section. The Black Mountains, the tallest range in the Appalachians, rise over the Toe River valley, as seen from the Hewat Overlook on the Blue Ridge Parkway at milepost 347.9. Contains one of the most photogenic waterfalls in the area. Named for historic meadows along the Parkway. This is the last stretch of Parkway along the Blue Ridge before it heads into the higher, interior mountain ranges. Campground (71 tent and 22 trailer sites, flush toilets, water, no hook-ups or showers). The State Park is 2.5 miles N. of Parkway on NC 128. It is not actually a Parkway facility but the Parkway is the only access. Contains the highest peak east of the Mississippi River. Campground (9 tent sites, water, flush toilets, no showers, no hook-ups). Features 60 RV campsites with full hookups, as well as tent camping with picnic tables and fire pits. Our amenities include an arcade and fitness room, trout fishing on the north Toe River, hiking and family fun. The campground is pet friendly, and has clean bath houses with laundry facilities, a gathering room and wi-fi.